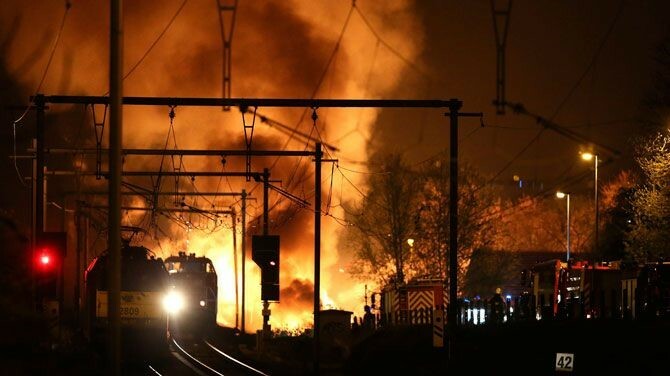 In the East-Flemish municipality of Wetteren east of Ghent, around 2 o'clock on the 4th May 2013, a freight train derailment caused a number of wagons carrying chemical products to explode. This caused an inferno and the release of toxic substances in the environment. The train was transporting the chemical acrylonitrile, a very toxic and inflammable fluid. It can cause breathing problems and is potentially carcinogenic. The train passing trough Wetteren was carrying huge amounts of the hazardous chemical acrylonitrile. Acrylonitrile is a highly flammable and toxic chemical compound, which is often used in the production of useful plastics and synthetic rubbers. As mentioned above, acrylonitrile can cause severe breathing and other health problems when exposed to it by inhalation or oral routes. Groundwater purification: activated carbon filters to the rescue! Due to the explosion, the acrylonitrile containers ruptured causing the chemical compound to contaminate the sewage system and groundwater near the accident. Shortly after the incident, an environmental specialist of the Infrabel (the company responsible for the Belgium railway infrastructure) checked the possibilities of DESOTEC mobile purification solutions to treat the contaminated groundwater. As first remediation, it was decided to excavate the contaminated soil and transport it to a thermal soil-recycling centre. A drainage collector system was placed to extract the groundwater from the soil. Two MOBICON® activated carbon filters were installed in series to remediate the water extracted from the drains. Two MOBICON®’s in series filled with ORGANSORB® 10CO have proven to be an efficient way to remove acrylonitrile and other by-products in a safe way. The used or spent carbon will be thermally processed at a third party hazardous waste treatment facility. Meanwhile, the Belgian railway company (NMBS) announced it will be putting the Schellebelle-Wetteren train line back into service as of June 29th, thanks to a successful detoxification operation. DESOTEC Activated Carbon is an international developer, producer and supplier of purification solutions mainly based on activated carbon technology. Our complete solutions include the supply of a wide range of mobile adsorption systems, the design, construction and start up of tailor made fixed systems and the recycling of used activated carbon. The AIRCON® mobile adsorption systems are designed to purify gases using the AIRPEL range of products while our MOBICON® systems are used to purify liquids with the ORGANOSORB® range of products. The secret of our success is our vision of customer service, 24 hours per day and 7 days a week.